and is constructed with LVT with micro-beveled edgees. As the U.S. population continues to age — the U.S. Census Bureau recently reported that by 2035 there will be 78 million people 65 years and older compared to 76.7 million under age 18 — assisted living facilities across the country are undergoing extensive redesigns in an effort to meet the needs of the next generation of residents. 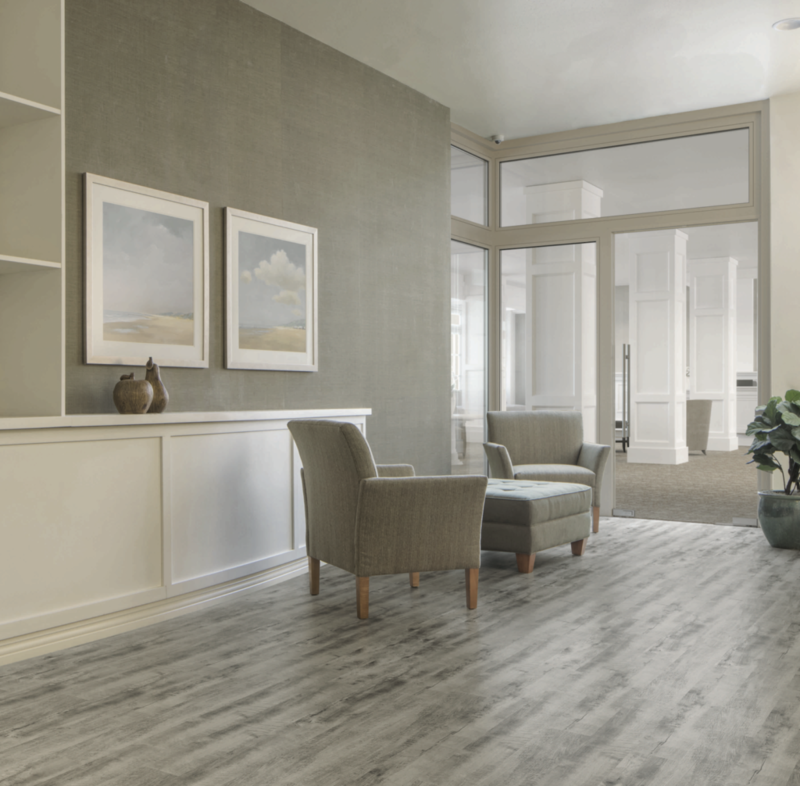 However, unlike generations past, healthcare designers and flooring vendors alike have noted a shift from an “institutional” look within these spaces toward a more homey, residential feel — a new design focus that has the potential to better support patient outcomes. Within those applications, flooring has become an integral component, capable of bringing the entirety of a design together. April Hoelscher, senior marketing manager, commercial channel, Armstrong Flooring, noted one of the major trends in this design is providing access to nature and the use of natural elements to help promote healing. “This concept extends from healing gardens and expansive views to material finishes that mimic natural wood and stone,” she said. She’s not the only one. Kieren Corcoran, Patcraft’s director of performance markets, also noted a popularity among nature-inspired product choices. “In memory care or areas with seniors who have cognitive disorders, while colors that are applicable to moods and rhythms — low contrast and limited-use yellow hues — are common, we are seeing larger organic/nature-inspired patterns with cool and warm neutrals remain popular,” he said. Color can also play a role in creating a home-like feel. “The use of warm colors, across both wood and stone visuals, allows for the creation of an inviting, comforting environment,” Browder said. 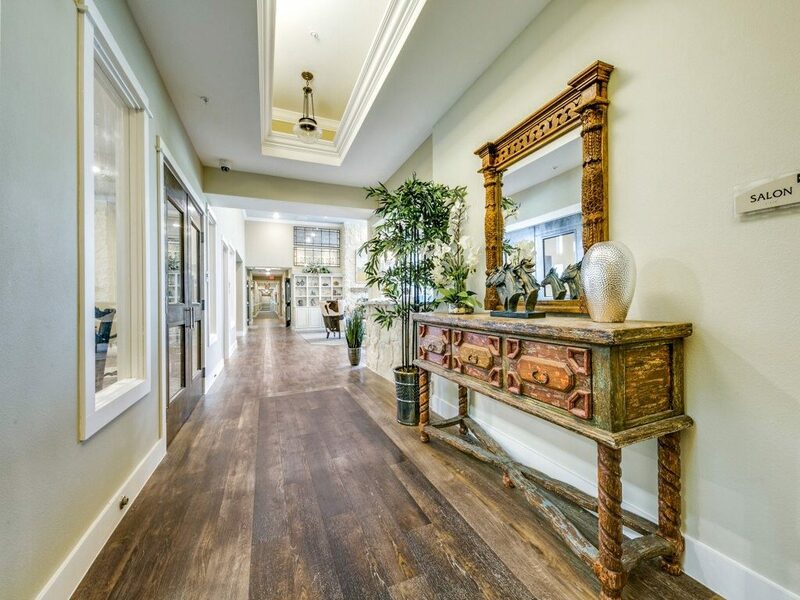 Karndean Designflooring’s Van Gogh collection features a variety of wood looks. As for hard surface, Corcoran said the company is also seeing a broad use of natural-looking wood visuals and those that have low color contrast between pieces and are highly coordinated with carpet choices. 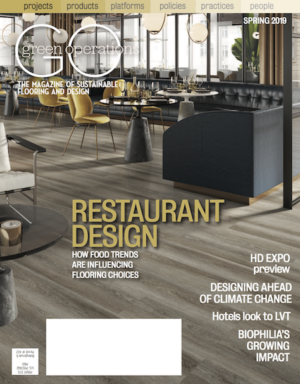 Al Boulogne, vice president, commercial resilient business, Mannington, said resilient flooring, including sheet, planks and tiles, continues to gain traction because of its overall performance story combined with limitless design capabilities. He also noted the importance of aligning a design aesthetic across multiple flooring types to create a truly cohesive living space. While material design plays an integral role in the success of these commercial spaces, designers agreed safety remains a top propriety. However, safety and design are not mutually exclusive, and some designers noted several ways in which the two can combine to improve the overall outcome of a space — and those who reside inside it. Wayfinding, for example, is an important part of healthcare safety design as it not only allows visitors to find their way but can help keep residents from getting lost. When implemented correctly, designers said, wayfinding can reduce stress levels for patients, visitors and staff. She added that rolls of homogeneous and heterogeneous sheet product can provide endless corridors and walkways with safe, level pathways without bumpy transition strips that can handle shuffling walkers to heavy rolling loads without adding excess resistance. with Burnished Cypress was used to zone a majority of the dining area. 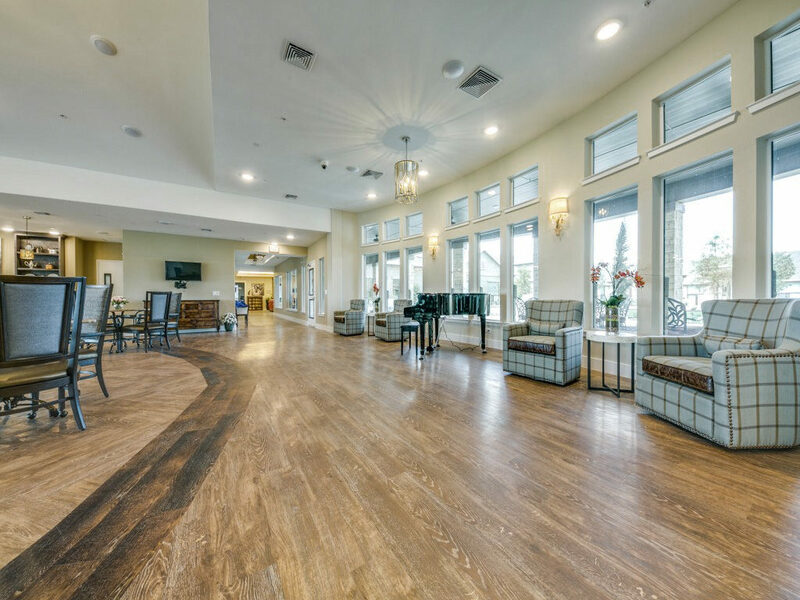 When it comes to senior living, manufacturers are also answering the call for eco-conscious design, a factor especially important in healthcare. However, vendors noted sustainability has evolved in recent years and so, too, must design.